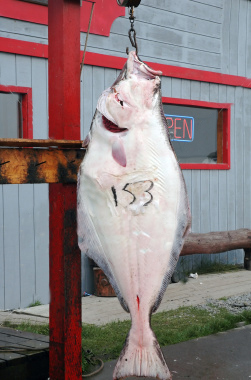 Catching Halibut that weigh in the hundreds of pounds is not unusual. The Pacific Halibut, scientifically known as Hippoglossus Stenolepis, closely resembles the Atlantic Halibut, and is known as the largest flatfish in the Pacific Ocean. It is also known as the northern halibut, right halibut, and alabato. Its body color usually ranges from dark brown or grayish brown with occasional light spots. Being a flatfish, the Pacific Halibut has both eyes on the upward facing side of the body. The bottom side has no eyes, and is light in color. The female Pacific Halibut can weigh over 470 pounds and can live to a maximum age of 45 years. Females can grow up to 9 feet long and are substantially larger than their male counterparts. The male won’t weigh more than 40 pounds, and only grows to around 55 inches in length. The males life expectancy is around 25 years, which about half of the females. The females are also known to be more abundant, and grow faster in all stages of life. The Pacific Halibut possesses strong teeth, and as young halibut, use them to feed mainly on small crustaceans. Adults can consume larger crustaceans, are fast swimmers, and have a diverse diet, eating aquatics like turbot, pollock, squid, crab and shrimp. They bury themselves in the sandy bottoms, allowing them to blend in with their environment. When prey swim over, they explode off the bottom while grabbing their meal, leaving only a cloud of sand behind. Most of the Pacific halibut live in the cold waters of the North Pacific from the Bering Sea south to California, and sometimes reaching as far as northern Japan. They migrate often, many times crossing more than 2,000 miles to hunt or spawn. In the more northern areas, they can be found swimming in the cold shallow waters of bays. Even small Halibut have aggressive teeth, be carefull when removing hooks. The halibut and salmon are considered to be a means of subsistence in areas around the Pacific coast. Fishing for halibut is currently monitored, only allowing a certain amount to be harvested each year. The halibut is one of the most important commercial fish in the area of British Columbia, but fisheries have recently had to cut back on production. 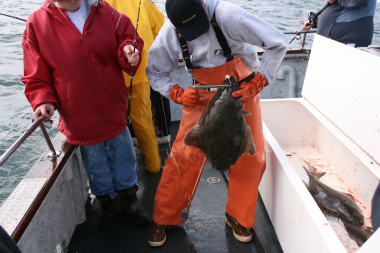 When conditions allow, the Pacific halibut can be caught while drift fishing using baits like herring, squid, or mackerel and other small fish. They can put up a pretty good fight, so heavy tackle will be necessary. Anglers will need to keep the bait floating right above the halibut so it will think that it is prey coming across. After it’s hooked, it will put up quite a struggle to stay on the bottom, but isn’t an aggressive fighter.